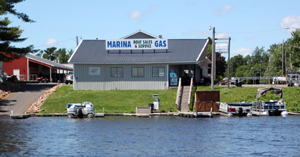 We offer the full line up of Montego Bay and TMC pontoons. We are proud that both lines are manufactured here in Wisconsin. When nothing but the best will do, you won’t have to look any further than our Deluxe Cruise Model. They feature attractive flush to top colored wall panels, accented with chrome logos, The deluxe console with windshield, chrome steering wheel, Bluetooth stereo and gauges give the pontoon a deluxe look. Polished corner castings, stainless cleats and tube skirting, all make these models very elegant looking from top to bottom. Performance and comfort! They include all the same features as the Deluxe Cruise models and then some. Hydraulic steering, 27 gallon built in fuel tank, with a max of 150 Hp engine. The 3rd center 25” pontoon increases stability and weight capacities. Steering responsiveness and a tighter turning radius are very noticeable. Enjoy the pontoon experience with a Sport Tri-Toon. When nothing but the best will do, you won’t have to look any further than our Deluxe Cruise Model. They feature attractive flush to top colored wall panels, accented with chrome logos, The deluxe console with windshield, chrome steering wheel, Bluetooth stereo, and gauges give the pontoon a deluxe look. Polished corner castings, stainless cleats, and tube skirting, all make these models very elegant looking from top to bottom. We call them “Standard” not because they are ordinary, but rather we feel they set the standard for the industry. They are built to the highest quality standards in the industry. There is a long list of available options for you to personalize these “standard” cruise models!